I have always been interested in the idea of growing everything I might want to use. My goal is to someday have a few acres, and try to produce at least all our fruits and vegetables. It's a lofty goal, but I like having something to aim for. Part of the reason this is going to be so challenging, is that we love our tea and coffee over here. Also citrus. But hey - The Olive Farm on Saltspring Island just produced the first Canadian grown olive oil last year, so I choose to believe that anything is possible! When I visited one of the local nurseries and discovered they had tea plants for sale I was so excited. I picked out one labeled 'Korean Tea' and headed home to research what I needed to do to these leaves to transform them into tea. All tea is made from the same plant (camellia sinensis), and depending on the process used on the leaves you end up with either black, white, oolong, or green tea. Herbal teas, rooibos, and yerba mate (although delicious infusions) are not technically considered teas since they come from other plants. It felt like I was googling for days to find out what I was supposed to do. Centuries ago the English sent Robert Fortune to go to China and uncover the secrets of how tea was processed since they were tired of depending on trade to obtain their national addiction. Somehow he successfully pretended to be Chinese and gathered several samples to send back home and tea cultivation started in India which was then still part of the British Empire. It felt only slightly easier than what Fortune went through to discover how I might produce a small amount of tea as a hobbyist with one tea plant and no specialized equipment. My plan was to make black tea, since I still had several types of green and white teas in my cupboard, and it seemed like the longest process, so if I could do that, I could figure out the other types. The first step was to pick the new growth, and let them wilt. After that, begin kneading, mashing, and rolling (my heavy marble rolling pin was useful here), the leaves until they start to turn red and oxidize. At this point it is time to let the leaves sit and ferment until they turn black. Things turned out a bit differently than I planned, because my house is really dry, and the leaves dried out before they finished all their fermenting. Halfway between green tea, and fully fermented black tea is oolong, and that is what I ended up with. While most of the teas we are familiar with are made from the fresh, new growth on the tea plant in the spring, there are a few other types made from the older parts of the plant. They all seem to have evolved as peasant tea - the poor people taking the leftovers of the plants after harvest and making something out of them. Bancha is the Japanese name for one such tea. This is essentially the same process as green tea, just made with the older leaves and stems. From there it seems genmaicha (bancha, or sometimes sencha, with added puffed rice), and hojicha evolved. Since I had some genmaicha in my pantry, I wanted to give hojicha a try. I also thought my coffee loving husband might like the roasted flavour of this tea. I started by pruning my tea plant into a more manageable shape. I had picked the largest one in the nursery, and after realizing better how tea is produced I figured it was a bit unruly. I steamed the trimmings for about 90 seconds, and then stripped the leaves from their stems, and cut the stems into more manageable lengths. After letting everything dry I threw it all into my cast iron skillet and stirred it all around until it started looking dark and toasty, and I could see the tiniest bit of smoke coming up from the leaves. I am looking forward to next spring when I will get to harvest again and make more. I also heard that I should expect to see flowers sometime in the autumn, and that they can be dried for tea as well, so I am excited to see that! It's still officially summer and the sunshine is still pretty warm, but where we are the air has some of that telltale fall crispness. In our chilly basement suite we are swaddled up in comfy sweaters and we've already ditched our iced coffee for homemade pumpkin spice flavoured ones. In our minds it's officialy fall. During the colder months we like to have a pot of something warm and spiced on our counter almost 24/7. I find that it serves two purposes - one is that you have a nearly constant supply of something warm and delicious to drink, and the other is that it fills your home with a beautiful warm aroma. My basic recipe varies quite a bit from day to day, but some green cardamom pods were the source of my inspiration lately. Here's the recipe. 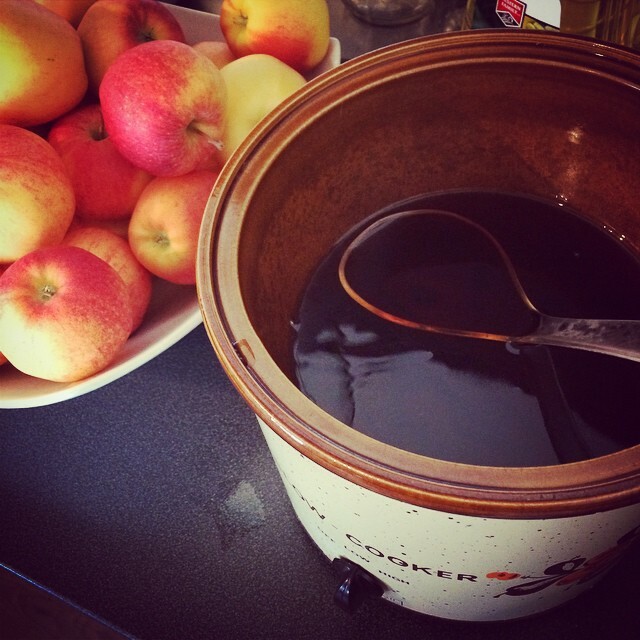 Fill - exactly how much depends on how many people you are serving - your slow cooker (or a pot on the stove) with apple juice. I usually use a four litre jug (one gallon for my American friends). We like to find organic and local juice if possible, but anything from the store will do if you're in a pinch. Add spices and turn the cooker up to high for a while. Once heated and steaming turn it to low. Allow the spices to mingle with the juice for at least 30 minutes before drinking. The longer you leave it the stronger the taste of the spices.